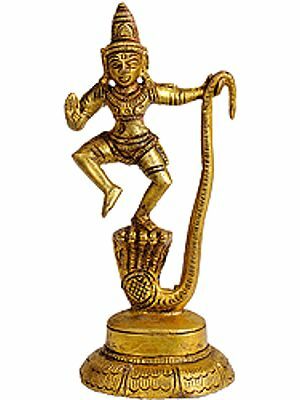 A magnificent brass-statue represents Lord Krishna subduing the venomous viper Kaliya – an episode from the Bhagavata Purana. The five-hooded serpent, represented also as a tiny human figure with folded hands, symbolic of its complete submission, appearing just under its hoods, is installed on an elaborately rendered circular two-tiered lotus pedestal erected on a three-tiered rectangular base consisting of a lotus layer in the middle, and mouldings, below and above. With his right leg lifted in air, and left, laid on the serpent’s head Lord Krishna – not the child Krishna of the Bhagavata Purana but as Vishnu, grown to his timeless youthfulness and crowned and bejeweled like him, is dancing on the serpent’s head. Holding its tail in his right hand he has lifted it into space as if to let the viper realise that the world is wider than its vanity and beyond its venom. With his right hand held in ‘Abhaya’ he redeems the world from fear, whatever its source, the venomous viper, or any. Krishna’s dance is reminiscent of Vishnukrant, the dance that Vishnu had performed in his transform as Vamana for subduing Mahabali, the vain demon king who once ruled the earth. The dance of Vishnu, as Vamana or Krishna, is the instrument of annihilation, not dissolution which Anandatandava, Shiva’s dance, affects. Vishnu’s dance aimed at eliminating an evil, not the entire creation. Hence, while in Anandatandava the left leg is lifted horizontally, a gesture symbolising dissolution, in Vishnu’s dance it is instead the right leg shot into the sky with upwards rise throwing the demon king beyond the known space suggesting destruction of a target seeking in the earth’s protection it context and relevance. As the myth occurs in the Bhagavata Purana and other scriptures, a venomous viper of Kadraveya origin and Pannaga type, named Kaliya, once migrated to river Yamuna from Ramanaka, an island in the ocean, where it earlier resided. Ramanaka was the dominion of the great bird Garuda, and for living there the viper paid the bird annual tribute. However, after a while, it stopped paying it. As a result the bird began attacking it every now and then compelling the viper to evict the island and shift to a new place. Kaliya chose river Yamuna which under a curse Garuda could not invade. Within hardly any time Kaliya so much polluted Yamuna's water by its venom that even a touch of it inflicted death on any living being, birds that passed across the region in the sky fell dead and trees and grass around burnt and dried. The ill-famed spot became known as Kaliyadah. One day Krishna, Balarama and their friends were playing on the Yamuna’s bank near Kaliyadah. In the course of the game Krishna climbed a nearby Kadamba tree and feigning to slip from it jumped into Kaliyadah. This sudden uproar irritated Kaliya engaged in merriment with its wives. The angry serpent got up and caught Krishna in its coils. It tightened its grip and seemed to crush Krishna. It horrified all but Balarama who, and him alone, was confident that Krishna would come out of it the moment he collected himself. He hence began boosting Krishna's morale. Others, Nand, Yashoda and all, prayed for Krishna's safety. Invoking his inherent energy Krishna began expanding his form so much so that Kaliya could not contain him within its coils. The moment its grip loosened Krishna jumped upon its head and began dancing with wind-like speed which began crushing the viper under it. Finally, it and its wives rushing to the spot piteously implored for mercy. Considering their prayer Krishna forgave Kaliya. He commanded the serpent to return back to ocean along his family for a river's geography was too small for a viper like it. Kaliya vowed to do so and not to harm anyone in future. With the mark of his foot on its hood Krishna blessed the viper with immunity against Garuda's attacks.